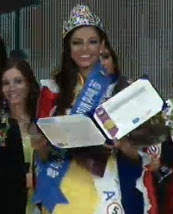 Miss USA, Siria Yasabel Bojorguez was crowned as the new World Miss University 2011 which took place in Seoul, Korea. 18 year old Siria Yasabel Bojorguez is currently studying in Texas Tech University. The 1st run-up was Miss Poland, Monika Plochocka, and the 2nd run-up was Miss India, Swetha Sridhar.